It’s pretty. And Fast. I never thought of the post editor as being slow, but there is something about Gutenberg that makes it feel fast. This is still true! Overall I’m still impressed with how fast things feel. And as some of the clutter pieces have been removed, it’s gotten even prettier. There are a lot of rough edges. It’s hard to know what is a bug, what is intentional, what just hasn’t been done yet, and what hasn’t been thought of. It is becoming clearer what is a bug (and they still exist), what needs another riff, and what is just new to me. The default state is likely my favorite “Distraction Free Writing” implementation in WordPress yet. I’m simultaneously able to focus on my content, and yet I have all the tools I need for writing. I don’t yet have all the tools I need for content creation. Creating content in Gutenberg has only gotten better. I need to take my hands off my keyboard more than usual. Adding a paragraph after a list isn’t easy to do with just a keyboard. It’s more keyboard friendly, but still has steps to go before I can really not use my keyboard. I like the direction Gutenberg continues to head in, but there are a number of edges that continue appearing rough. Some of those are the micro-interactions that continue to be iterated on, while others are the result of bugs (copy and paste right now is rough). Developing software in the open is hard. I'm continuously impressed with the Gutenberg team's ability to take critism and turn it constructive. Once better documentation is in place, I think we will start being at a point that we can consider when Gutenberg is merged into Core. I view the lack of great documentation as being a blocker for that discussion. Until it's easy for plugin developers to support Gutenberg, they can't build much and until things are built, it's hard to figure out when Gutenberg is ready to ship. How to use all the various extension points. I'd like to see some iteration around the taxonomies in the sidebar. In part to make custom taxonomies easier and in part to see if there are ways to make it easier. I'm going to be building something for production in February and am seriously considering building it in Gutenberg so it's more future proof. This post was the first time I needed to use the classic text block. Blockquotes and paragraphs inside list items might be an edge case, or perhaps the list block is too rigid. I'm going to try and remember to post more thoughts on Gutenberg in another six months. I think it will be in WordPress core by then, but I'm not sure if 5.0 will have been released. For others that have been using Gutenberg for a while, how has your opinion changed? Something interesting is how some text didn’t make it into the email of the blog post, but then perhaps you made an edit also. In the email your new thoughts point #2 stopped at “team’s ability to”. Your 3rd from the last point ends at “in part to” in both the email and what I see here so not sure if Gutenberg dropped some of your text. 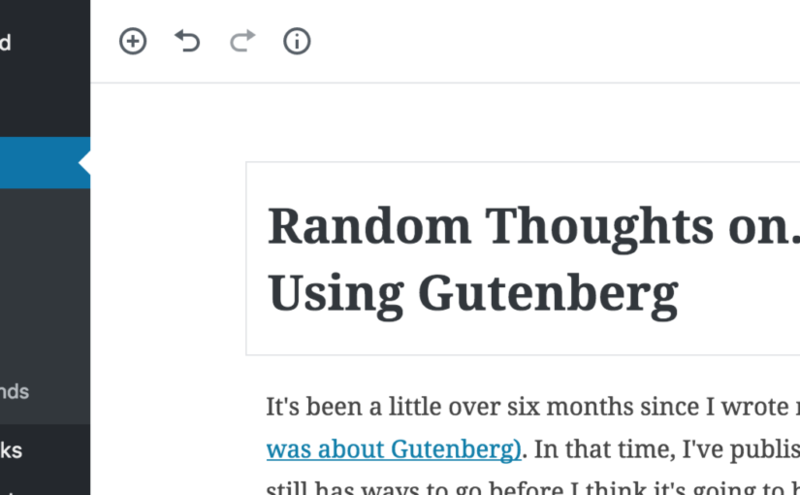 On the subject of using Gutenberg on my site I’ve been toying with that idea myself, and I really need to, but I write about 90% of my posts on my tablet or phone using the WordPress app, which I’m curious how Gutenberg is going to work with the app in general. It’s seems like with the app we will always have a classic editor. Those mistakes were on me, not on Gutenberg. It’s fixed now. I have no idea what the plans are for the native Apps, but react native might make it possible to simplify bringing the block editor there.